To stop your vehicles, you need press pedal on both sides of the brakes of the brake rotor, which rotates with the wheels. Driver must feel comfortable braking power with less pedal effort. The friction material of the brake pad will be worn out after using them. 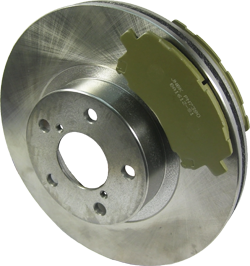 Brake pads that are worn out may cause damages to the brake disc rotor. The wear off rate or lifespan of the brake pad may differ based on the driving conditions or the way of braking by the driver. ※Note: Driver must seek service engineer for advice. When the friction material of the brake pad has been worn out, remaining with less than 5mm thickness of the brake pad, the temperature of the friction material can easily increase, causing the brake pad to wear off even quickly. Thus, it is strongly recommended to replace the brake pads at the thickness of 5mm. Brake pads with thickness of 10mm or more are at a safe state for usage. Brake pads with thickness of 5mm or less are not advisable for usage. Brake pads should be replaced as soon as possible. Brake pads with thickness of 2mm or less are strongly not advisable for usage as it is extremely dangerous. Brake pads should be replaced immediately. Every time the brake pedal is depressed, the brake shoes will be worn by a little. When the brake shoes are worn out, the metal parts of the brake shoes that are directly in contact with the brake drums might be damaged. In such a state, the brake will be unstable to handle and it is extremely dangerous. Brake shoes are usually replaced after travelling for 50,000km, but this may vary for different driving conditions.